Please note the current production batch is on light grey backing. 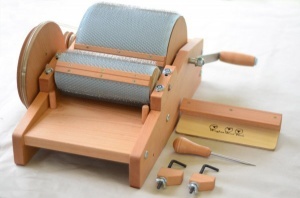 We sell a lot of cloth for drum carders, either as a replacement for old machines or for those looking to build their own carder. This card cloth is to the same wire setting as our standard drum carder. Previously we supplied tin plated card cloth wire which was a little cheaper than the stainless. We have now changed to stainless wire only as the quality of the wire and durability is far greater. Sold in sheets of continuous lengths. A normal drum carder will cost around £65 to completely re-cover, though of course this can vary. To calculate the amount you'll need we suggest you multiply the diameter of the drum by 3.142. We always add a little bit extra for free to allow space for making the join. Card cloth is normally fixed to the drum by staples or tacks along the edges only. A joining line, often made of a thin strip of metal, will not only fix the cloth but also provides a space allowing the carded batt to be removed when you've finished. Do not use glue as this ruins the flexibilty of the cloth and turns it into rigid pins. We don't recommend the use of double sided sticky tape as all adhesives on tapes have a life and it may fail. Tacks or staples do a much better job. Wire setting 72 points per square inch. This is a good general setting for most fibres ad is the PPI that we use on our hand and drum carders. You may find on very old carders that are covered by strips of card cloth about 1" wide with a very stiff action. This is carding fillet designed for use on very large drum industrial machines. It was often used because it was acquired from industrial machine covering companies. More often than not it is too stiff for hand drum carders. It can be replaced with the card cloth we produce to give a gentler action to the carding of the fibres.